Description: This one-stop reference book on the vital relationship between Scripture and ethics offers helpful orientation and perspective for students, pastors, and scholars. Written to respond to the movement among biblical scholars and ethicists to recover the Bible for moral formation, it is the best reference work available on the intersection of these two fields. The volume shows how Christian Scripture and Christian ethics are necessarily intertwined and offers up-to-date treatment of five hundred biblical, traditional, and contemporary topics, including tithing, euthanasia, the Trinity, population policy and control, healthcare systems in Scripture, the seven deadly sins, idolatry, the image of God, terrorism, the Sermon on the Mount, vegetarianism, and the Dead Sea Scrolls. The stellar ecumenical list of contributors consists of more than two hundred leading scholars from the fields of biblical studies and ethics. Citation: Kevin Jung, review of Joel B. 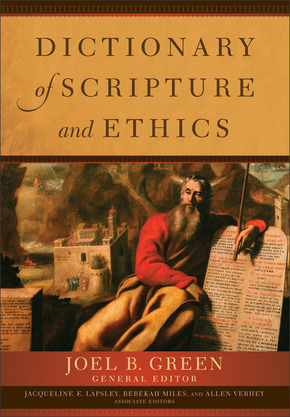 Green, ed., Dictionary of Scripture and Ethics, Review of Biblical Literature [http://www.bookreviews.org] (2014).